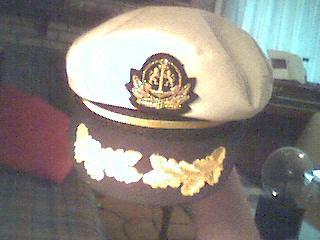 This is the captain's hat. I got it in a gift shoppe at Chandler's Landing Yacht Club in Rockwall, TX many many years ago. While its been little more than a novelty item, like most of the crap I have, it has served to amuse quite a few people on the cam.